This is an epic volume serving a dual purpose. The first is to educate the “perfect gentleman” as to where to find the “requisites” for his impeccably stylish life. The second is to retell the history of a golden square mile of retail establishments that have been catering to perfect gentlemen since the 1600s. Mr. Sherwood speaks of East End London also known as the St. James district. Even the most jaded Anglophile will likely be awakened to establishments that have been in this area for hundreds of years. Without telling too much of what is contained in this book, are you cognizant of Bates, G. J. Cleverley, Graziano & Girling, Purdey, Wartski, or James Smith—all famous haberdasheries? All of these establishments and many more have been catering to royalty, dandies, and Hollywood luminaries for centuries. Any proper gentleman is already familiar with Lobb, Huntsman, Floris, Penhaligon, Anderson & Sheppard, and Turnbull & Asser—all of which and more are included in this glorious guide to being a gentleman for the 21st century. Mr. Sherwood offers up a comprehensive and all-inclusive recipe for how to achieve the elevated status of The Perfect Gentleman. The book is an extremely timely reminder about craftsmanship, heritage, and quality. Its release is in synch with so many brands currently trying to emphasize their histories to give them a gravitas beyond trend and momentary fashion. Not only is The Perfect Gentleman reflective of the commercial side of these rarefied businesses, but it also speaks to a renewed interest in everything that is bespoke. 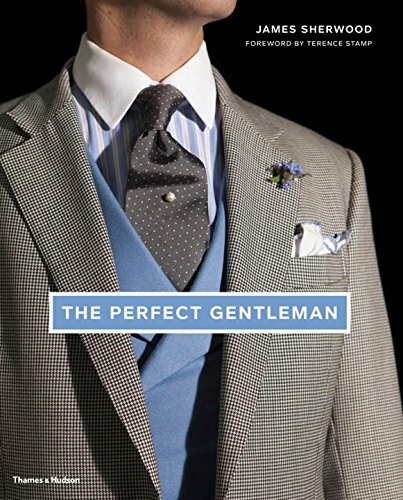 The Perfect Gentleman is a book that will satisfy the budding dandy, the jaded shopper as well as the seasoned Anglophile. The Perfect Gentleman is the perfect holiday gift for men who have more than a passing interest in all things English as well as those with an abiding sartorial habit to feed. The coffee table edition, with its extravagantly lush photographs and illustrations, will no doubt provide an endless source of conversation and enjoyment for years to come.